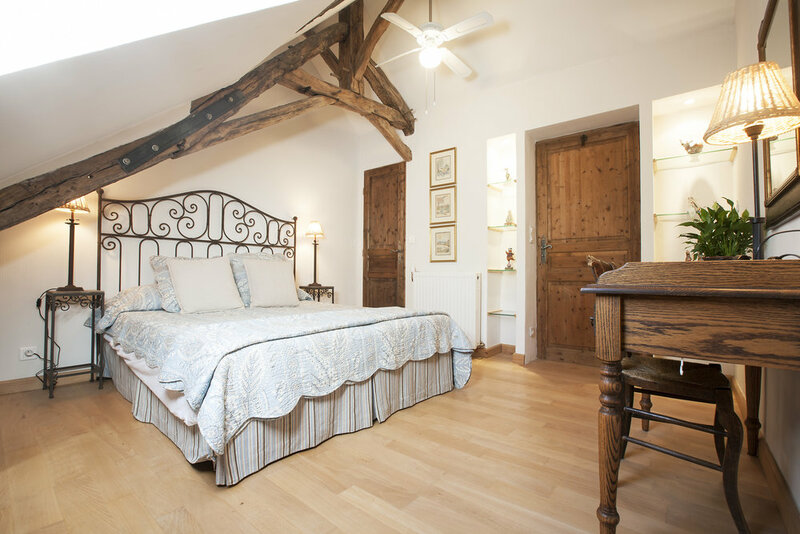 A wooden staircase leads to the second floor, which houses a large bedroom (queen size bed 140 x 190 cm), walk-in closet and full bathroom with shower, toilet and Victorian bath. area 40 sq m. The second bedroom and en-suite shower are found on the third level. Double or twin beds can be arranged. surface area 19 sq.m. Rates per week Saturday to Saturday Minimum 5 day stay. 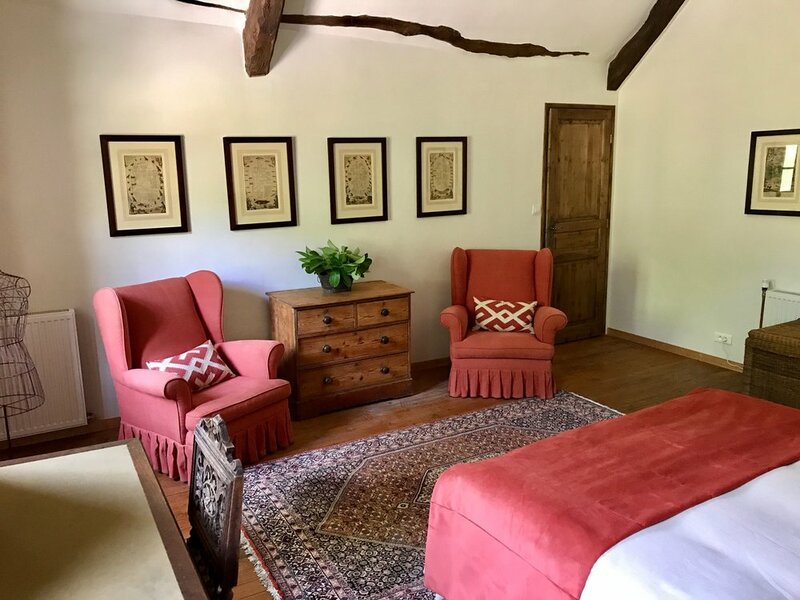 The accommodation is set within an old barn surrounded by beautiful gardens and adjacent to a mill stream and mill race. The rooms are elegantly furnished and very well coordinated and the kitchen is well-equipped. There are plenty of fans supplied for the very hot weather and the house is managed by a really efficient, cheerful and helpful person. Being old, the downstairs interior of the barn remains cool even on hot days. We were able to visit a different village every day. 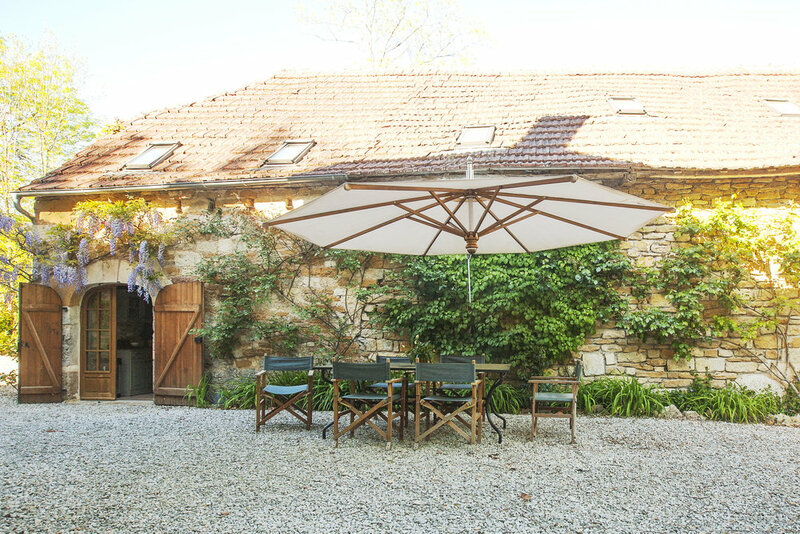 Villages like Collonges la Rouge, Turenne, Martel, Rocamadour, Sarlat are all within a 50 minute drive. We also enjoyed canoeing down the beautiful Dordogne river which is an easy 30 minute drive. There is great attention to detail in both the house and garden are kept in immaculate condition. If you're looking for peace and tranquility, this is the place for you. “We recently had a week stay at 'Rouge' during France's week of heavy rain. Despite the rain we found 'Rouge' the ideal place to visit the Dordogne Valley. So many picturesque villages to see, all within a short drive! The house is charming and tastefully decorated with everything you would have in your own home. The owner's local representative, Fiona, was extremely helpful, with lots of advice and provided some supplies for us for our arrival on a Sunday when the shops were closed. A great place to spend a week or more! This was our fourth time in Rouge. We love both the house and the area, which is rural, quiet and unspoilt. We have found lots of lovely walks within short car rides of the house and there are pretty villages and towns within easy reach. The house is beautifully furnished and is maintained by Fiona of whom nothing is too much trouble. She is always available, always cheerful and unfailingly positive. The kitchen is convenient to use and is well - stocked with glassware, crockery and utensils. The garden is large, pretty and well-maintained with a stream and two mill ponds around it and beside the house. 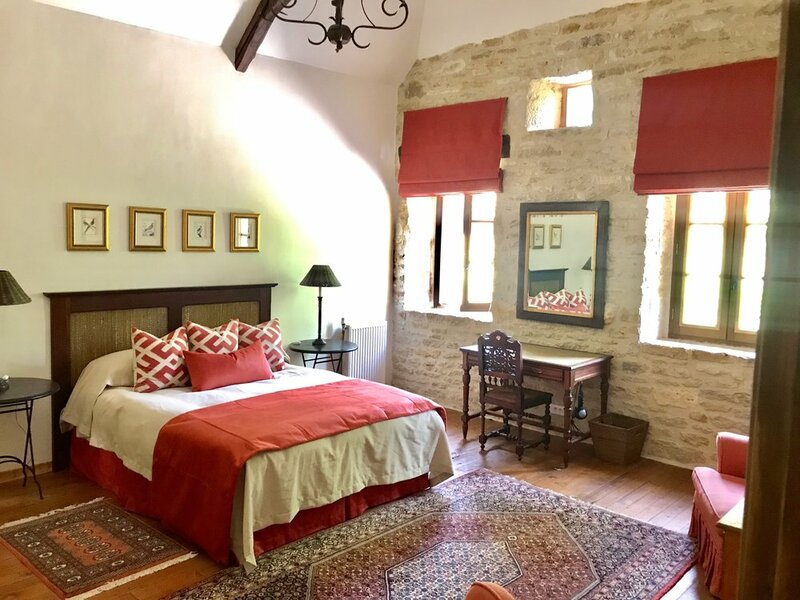 Experience authentic France at Le Moulin de Malecoste.